An elderly grandma was rushed to the hospital after she made a cop fear for his life and deploy his taser causing her to collapse in the road. Greene County, TN — Greene County Sheriff Pat Hankins is standing up for his deputy this week—noting that he supports his deputy’s decision to deploy his taser on an 81-year-old woman on Sunday. Apparently, 81-year-old women with dementia holding gardening tools are now cause for cops to fear for their lives. The sheriff said he supports his deputy’s decision because the officer was forced to think fast and only had 14 seconds to decide what to do. According to Hankins, the deputy’s only options were to kill the woman or take a chance risking his life. Naturally, bravery was out of the question—apparently, so was walking backward. Some Sheriff’s Office reports we obtained claim she suffers from dementia and often sees things that aren’t there. On Sunday, September 24, Greene County deputies responded to a home on Wilkerson Road in Mosheim. Erwin’s son called 9-1-1 telling dispatchers his mother was being combative. According to an incident report, Erwin was using a broom to beat on cars and was yelling. That report, says she has dementia and says she often sees things that aren’t there. According to reports, there have been more than 40 calls for help from Erwin’s home in just the last year. By all measures, police were familiar with the elderly woman. However, the deputy who responded was apparently unfamiliar with showing any type of courage in the face of the very tiny amount of danger—if it can even be referred to as such—presented by an 81-year-old woman holding a rake. Many of the calls to 911 from Erwin’s home were actually made by her. Her dementia often caused her to see people on her property who were not actually there. However, when the deputy came this time, she could see him and so she demanded he leave her property. This past Sunday, deputies left the scene but were called back about 40 minutes later. The report says when they arrived back on scene they saw Erwin had a garden rake in her hands. Sheriff Hankins said Erwin had already knocked out several windows with the rake when they arrived. According to the deputy, Erwin started walking toward him saying “get off my land.” However, the deputy claims he was 50 feet from her, in the road, not on her land. Instead of backing up, walking away, grabbing the rake, or doing anything that required even the smallest amount of bravery, the cop made sure he wouldn’t have to risk a single little hair on his body and deployed his taser. Erwin was 10-12 feet away when this deputy felt the need to take her out—because he thought an attack was imminent—from an 81-year-old grandma with a garden tool. When the taser hit her, she fell to the ground. Only then did the officer move in to place her in handcuffs. According to WJHL, EMS took her to the hospital for evaluation. The report indicates charges are pending. Every day, in assisted living facilities across the country, elderly men and women with dementia lash out at what they perceive as a threat. And, every day, unarmed health care workers calm them down without having to taser them. 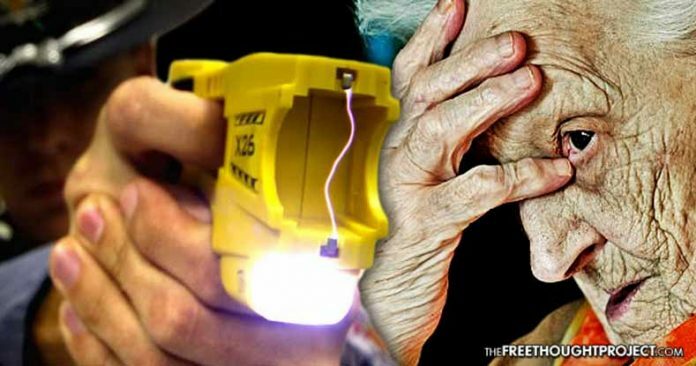 A police officer deploying a taser on a harmless 81-year-old woman illustrates the ominous training of police departments today. Do not be brave, do not risk injury, swiftly and immediately escalate force to avoid having to employ any heroic action to help an 81-year-old woman with dementia—god forbid you take a tiny risk to remove a rake from an elderly woman.